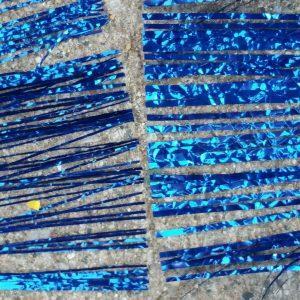 Banded Mylar, sometimes known as mylar tinsel, is used in trolling flies, hair flies, spinners, crank baits, ocean lures, jigs, and other fishing lures. It can be used to make lures for salmon, steelhead, kings, coho, bass, muskie, walleye, pike, panfish, trout, ocean fish, and more. One of the most frequently asked questions we get is “What is the difference between Bandaboo and regular material?”. Both come in one yard length packages and can be used together or separately. Standard cut is what 90% of the commercial flies on the Great Lakes are made out of, and Bandaboo has been used for making hair type flies. People frequently mix both types together. It’s all about the width of the fringe. The width of the Bandaboo fringe strands is about half of the standard material.